Zakir Hussain is not jaded by his success. It was said by many a musician that no man could possibly evoke as many sounds from a drum as Ustad Allah Rakha, until they were silenced by the performance of this man. Legend goes that when he was just a few days old, this same legendary tabla maestro whispered not a lullaby, or a blessing, but the notes of the tabla in his ears. The infant was Khan sahib’s gifted son Zakir. 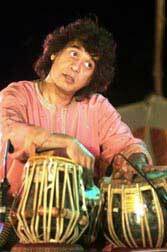 To be born to Ustad Allah Rakha is a privilege, to carry on his mantle an incredible responsibility, but Ustad Zakir Hussain has managed to do so with amazing grace. Starting out at a very tender age of two or three, and touring by the time he was 12, Zakir has emerged today as a global icon of world music, enthralling audiences with both his traditional and innovative performances. From accompanying all the great legends in the world of classical music to carving a name for himself in both the purist tradition as well as his innovative offerings like Shakti, Diga Rhythm band , Tabla beat science, Zakir has swept aside all competition and sweeped up awards and honors both national and international in his unending musical journey. Jet lagged after arriving from India, Zakir Hussain sat down for an exclusive interview with Little India. Your father left a farming family, roughed it out to follow his passion, and became a musical giant. How hard is it to carve a niche for yourself and how has your musical journey been as compared to his? I have still not carved my own niche. I am still my father’s son and I will always be, and I am very proud of that. I think a musician’s journey is never different from another’s. It is just that the area of visibility may be different. Every new generation brings an area of new visibility to an artist so in that case the main difference is that a major part of my journey was all over the world, including India, while a major part of his journey was in India. It is not as if I have done any thing different or that my tabla sounds different. It is different only because the stage is different. Today the world is my stage and I am recognized as a principal tabla player of India. So are you saying that you are not doing anything unique or different that has brought you the recognition that you have today? No swami or rishi today can tell you anything that has not been said before. It is just that it sounds different when somebody says something in a way that appeals to you or if he or she is confirming something, you already know or have thought about. We are talking about a 3,000-year-old history of music and musical tradition, and you are told to stick to that tradition, and not to be radical. I played the tabla for 20 years and no one took any notice, and I have not really changed my style of playing tabla. The attention that I have received today is because of the media, and the only thing that has changed is that I have been able to be out there in front of people of the world who have not heard this kind of music before and may be the way I look and my interaction with them and my way of explaining things to them may be easier for them to understand. So what was not visible to them earlier has become clear and people instantly start assuming that maybe I am doing something new. It is often said of you that though you have received your taleem in the purist tradition you are always open to trying out different things and are quite the adventurer. What makes you so open-minded? Because I am young and the world is my stage. Until my father’s time musicians performed mostly in India and had only that much area to work with. I was growing up at a time when the Indian film industry was developing and we grew up with the Beatles, and Elvis and Hollywood so my perception of our boundaries and how far we could stretch was different from my father’s. I heard you actually went to a Catholic School? I did and I have to thank my mother for it. In spite of being a strict Muslim, she did not limit me to the Arabic schools, but sent me to a Catholic school. Maybe she knew what was coming, who knows. My father would say why does he have to go to school? He is always going to play tabla, but having been educated, my views on what makes music are less defensive. Personally I think that a musician or for that matter every artist is an adventurer, so there is no inbuilt defense mechanism that stops you from exploring. After all the whole idea really is to take what already exists and explore ways by which to say it or make it look different and unique, and present it in such a way that it appeals to people. That is why we have Jesus and Prophet Mohammed. They all said the same thing but in their own unique way. That is also precisely, what Allah Rakha Khan and Ravi Shankarji and Bismillah Khan have done. They have said the same thing so differently in such a unique manner that people feel something wondrous has happened and that is the magic the person providing that knowledge is casting, through his own magnetism and inner vision. Therefore, I am not doing anything different. I am just able to package and present it in a way that people like to hear, but they did not hear me either for 20 long years. Now after having slaved and worked at it for that long a time, finally my audience and I are on the same wave length. This will go on for a while until they decide he is still saying the same thing and then they will look for someone else. Well it does not seem that people are tiring of you! It has lasted so long because of the power of the media, and lack of it is the only reason the legends of yesteryears have not been heard or seen that long. Superstar status allows you to linger on for a little while longer but unless you continue to deliver, you are always replaceable. Has the fact that non-Indians are so into classical art forms surprised you? There is also criticism that artists are getting jaded and are not fresh and creative anymore because of the fast pace and over booking of concerts. No, that craze was always there. In fact, it was maniacal during allah Rakha-Ravi Shankar days. Every body was going out to buy sitars and tablas and Nehru jackets and tie and dye stuff. I do not think artists are any less fresh, creative or innovative today. It just depends on whom you are talking to. People who grew up with Bade Ghulam Ali Khan, Vilayat Khan, Bismillah Khan and such legends expect music to be a certain way and remain a certain way. It brings back memories of their youth. Therefore, when others are not like the people they grew up with, or are not playing music the way it was played then, that seems wrong. But then that is their view, and they do not want to go with the flow and the change. But when you listen to the young musicians like Shahid Parvez, Buddhaditya Mukherji, Rashid Khan you know there is genius at work here, that something incredible is happening and these people will be remembered as the legends of their times. 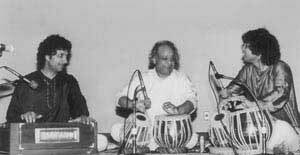 I am sure a young Ravi Shankar, a young Ali Akbar Khan had to go through the same criticism, and I cannot imagine the music lovers of yesteryears not seeing that and appreciating that eventually. You said that there was no such thing as fusion music, and that what Ravi Shankar and Yehudi Menhuin did was that one artist just played a piece composed by the other. You changed all that. Ravi ji of course says he does not like fusion music. Yes I did. My approach was that why should someone always have to play just my music and why should I think that my music is the music. Just as they are crossing over boundaries and coming over to play with me, I should also cross over and play with them. By learning their music, I can communicate better with them, in their own language and that is the reason why people like John McLaughlin understand western and Indian music so well. He and I we were able to cross over the boundaries that had been established earlier and educate each other. That is why Making Music is such a good album. Ravi Shankar did not venture into fusion because he was needed to establish Indian music and make people of the west understand what it was all about. That was the immense contribution of artists of his time – to lay the foundation, the platform upon which artists like me can bounce other things, and even cross over, because today our identity is set and we can innovate but we will never lose that base. Shakti, was an amazingly successful experiment in fusion, Diga Rhythm Band in rhythm fusion, and now Tabla Beat Science is yet another feather in your cap! Well that too was a natural progression. When the world does turn, new horizons appear, and there will be one among us who will stop and look and explore those new horizons, and Talvin Singh was one of those who did just that with techno, rave, electronica, and so we decided to explore and see as well. The DJs and techno artists were using Indian instrument samples to do their electronica music and so we thought why not just use real instruments and musicians and inject it with human warmth, making it more alive. That is how Tabla Beat Science came about and it has taken off. How great it will be or how long it will last remains to be seen, but if a great legend like 65 year old Ustad Sultan Khan can hook up into it and do stuff then it definitely has some validity to it. Our idea is to always try to come up with something that allows every aspect of art in the world to touch Indian art and see if something rubs of on each. If not we move on to try something new. Traditional music, fusion, techno, and now after giving music in films you have made your singing debut in Mr. and Mrs. Iyer, so what now? I still cannot say that the best I have played today is going to still be considered good enough tomorrow. There is nothing that I have done to this day that I can call the greatest triumph of my life and I have not played good enough to say I can quit now. I love performing live and am excited by an audience that is incredibly supportive and knows that each time we go on stage they will be an important part of the musical adventure, the exploration. When I came up with Shakti and Diga Rhythm Band there was no fusion or rhythm fusion, or even world music. We even won a Grammy for Planet Drum. So I feel fortunate that I was able to initiate some things that led to an understanding of music as one global entity and I want this to be a base for other musicians to take the musical adventure and the exploration a step further.